Merry Christmas! I thought it would be fun to post this on Christmas, but I'm posting a little early in case you happen to be Catholic and want to check out the Cathedral for mass tonight or tomorrow. I didn't know until I started researching this that there are Cathedrals, and then there are Cathedral Basilicas, and that ours did not become a Basilica until Pope John Paul II's visit in 1997. In the Catholic sense (it also has an architectural meaning), Basilica means it's an important church that has had special rites performed by the Pope. Click on over to the Facebook page and see a picture of the Pope Chair from his 1997 visit! 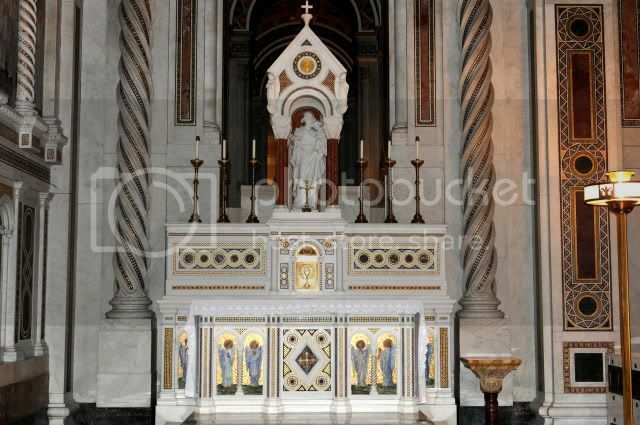 I'm going to be using a lot of closeups to talk about the mosaic process, so I suggest checking out the virtual tour (particularly the Baldacchino, but there is a slideshow for each area I mention) on the Cathedral's website to see the full scale of the building. 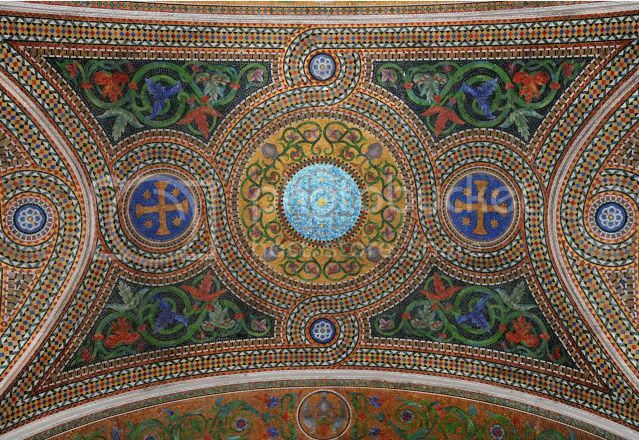 The mosaics cover 83,000 square feet, one of the largest collections of mosaic art in the world, and a real challenge to photograph on those domed ceilings. Above and below are views of the Blessed Sacrament Chapel. Construction of the Cathedral Basilica (or as many St Louisans refer to it, the New Cathedral), began in 1907 under the leadership of Archbishop John Glennon. Installation of the mosaics began in 1912 and was not completed until 1988! 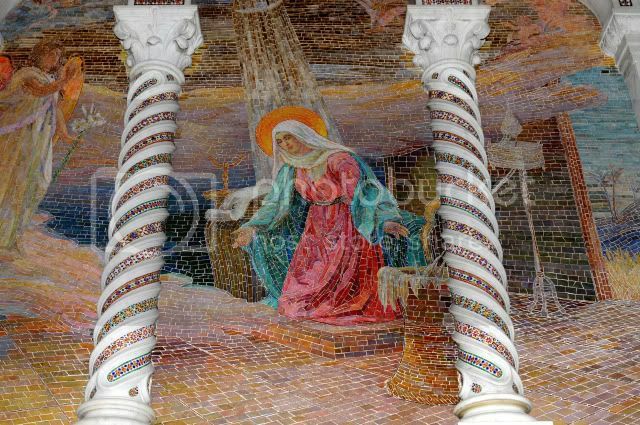 Much of the manufacture and installation work was performed by the Ravenna Mosaic Company of St Louis, which was a joint venture of the German mosaic designer Puhl-Wagner and the St Louis glass artist Emil Frei. 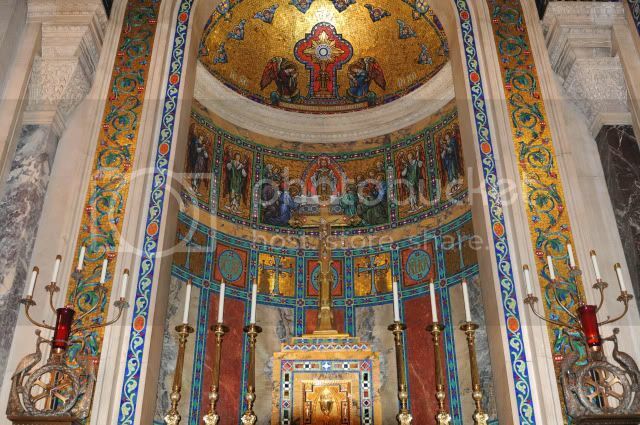 Ravenna Mosaic is most well known for the Cathedral Basilica, but you can also see their work at Share Emeth Temple in University City, Our Lady of the Snows Shrine in Belleville, IL, the Soldiers Memorial in Downtown St Louis, and the 7UP building in North County (St Louis). The history of the company is quite fascinating, and you can read more about it on St Louis University's website, The Ravenna Mosaic Company: A Retrospective. 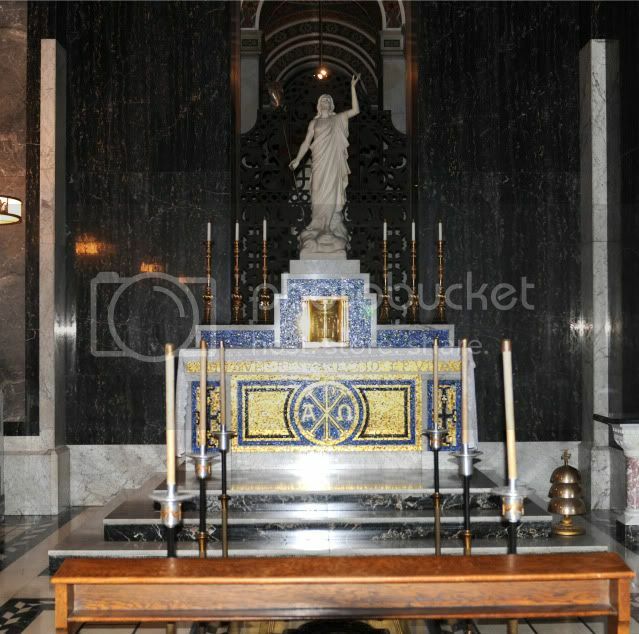 Above and below are images from the Blessed Virgin's Chapel. 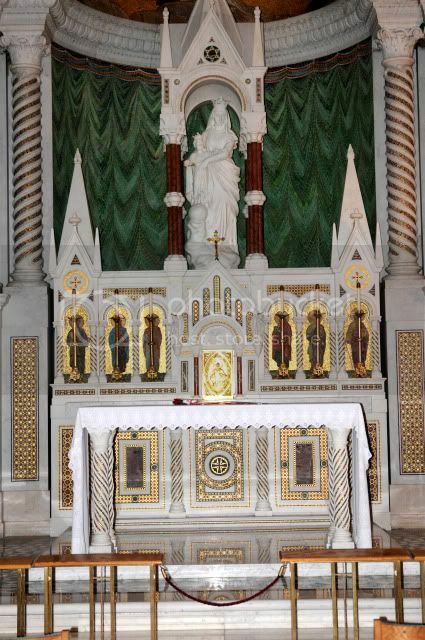 This and the All Souls Chapel were designed and installed by Tiffany Studios. 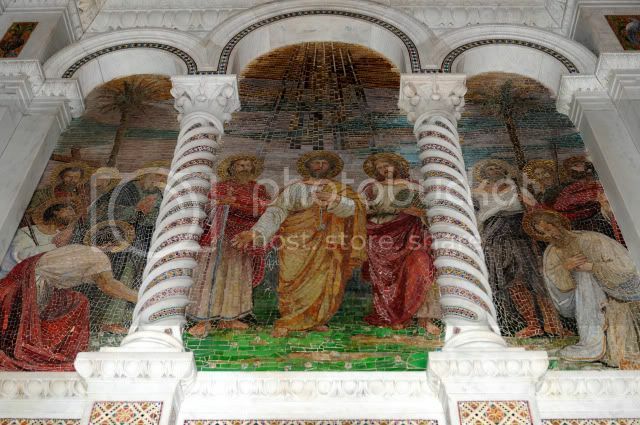 These mosaics are done in the Italian style, as opposed to the Byzantine style of the rest of the Cathedral. Above and below, the All Saints Chapel, also designed by Louis Comfort Tiffany. In the basement is a mosaic museum that details the building of the Cathedral and the process of designing and installing mosaics. It begins with sketches and watercolors of the design, and sometimes a scale model. The artist then does a medium scale "cartoon" for the fabricator to work off of. Each individual tile of a mosaic is called a tesserae. 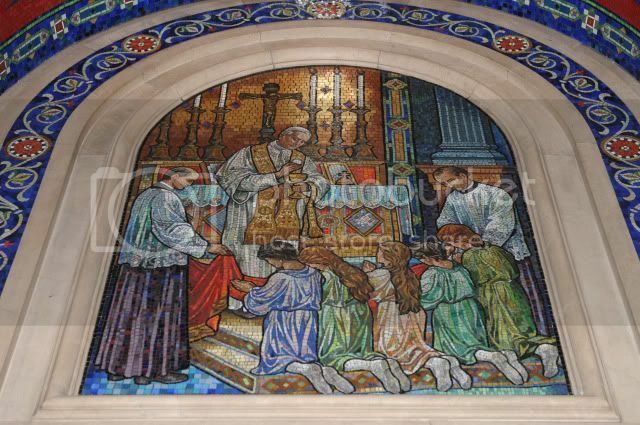 It took 41.5 million tesserae to create the mosaics of the Cathedral Basilica, in over 7,000 shades of color. The mosaic fabricator selects each piece individually, sometimes using a mallet and chisel to get the shape exactly right. The mosaics are mounted on paper, face down and backwards, and intricate drawings detail the exact placement of each sheet for the installers. It looks kind of like paint-by-number, if no color was used twice and the numbers went into the hundreds. As you may already know, I work in the flooring industry and am familiar with face-mounted mosaic tile, but this absolutely blew my mind. I've never encountered a tile job that approaches even a fraction of the scope here. I like this one above because you can really get a feel for what they mean when they say there are 7,000 colors of tesserae. 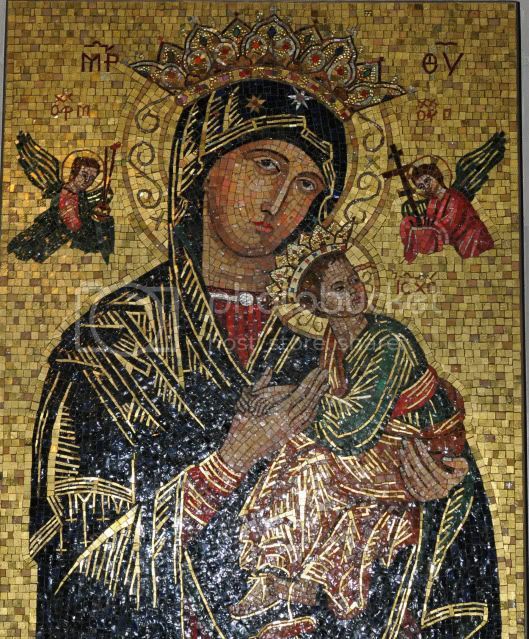 Look how many shades of gold are in that one mosaic. 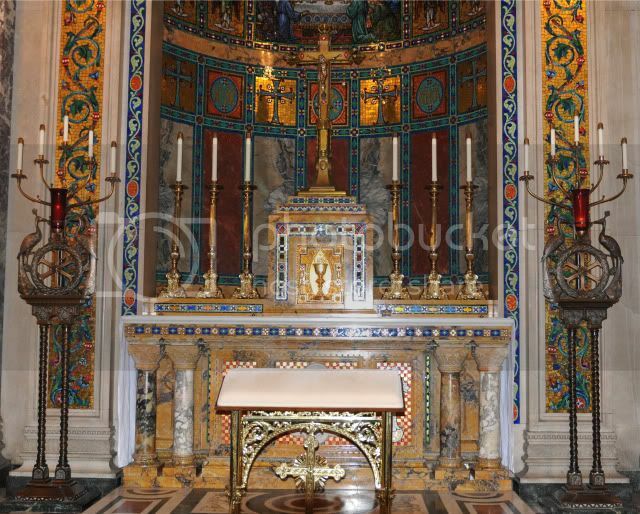 The All Souls Chapel (above) doesn't have a ton of mosaic work, but is worth mentioning because it's positioned over the basement crypt of Cardinal Glennon, Cardinal Ritter, Cardinal Carberry, and Archbishop May. The style is Viennese Reconstruction and uses black marble to symbolize death and white marble to symbolize resurrection. The hats of the Cardinals hang in this chapel above their burial places. 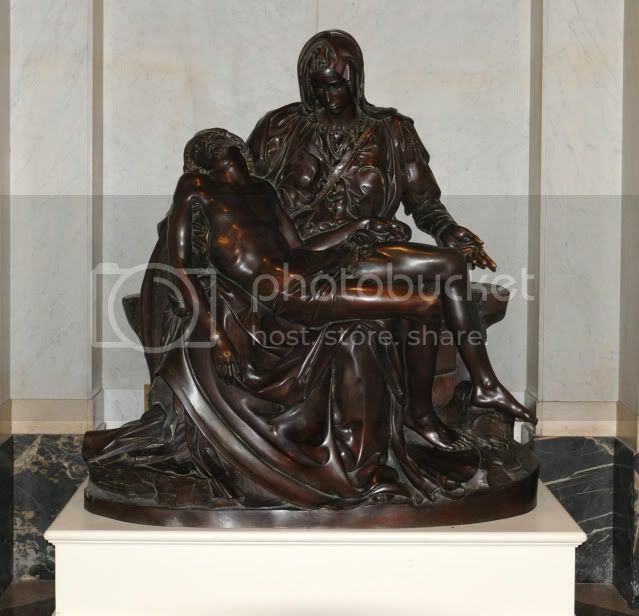 One last item of note is that the Cathedral Basilica has a bronze replica of Michelangelo's Pieta on display for a limited time. 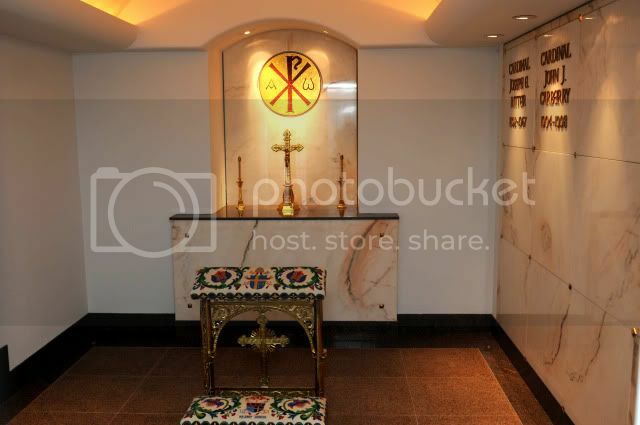 It is located at the bottom of the stairs leading to the Blessed Sacrament Chapel. This is one of twelve bronzes cast by Fernando Marinell from a mold of the original marble statue, and one of two currently on display in North America. 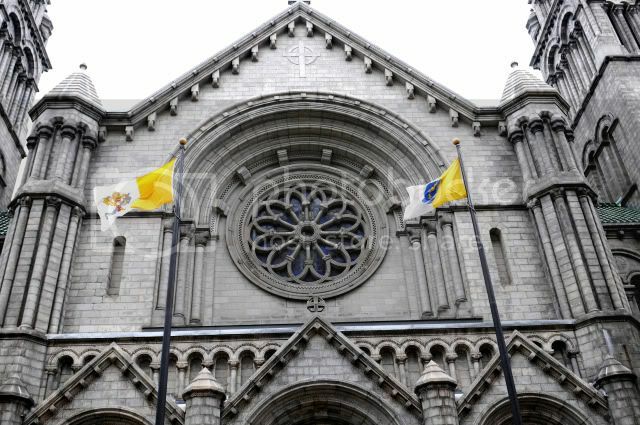 The Cathedral Basilica is located at 4431 Maryland. Admission to the Mosaic Museum is by donation. 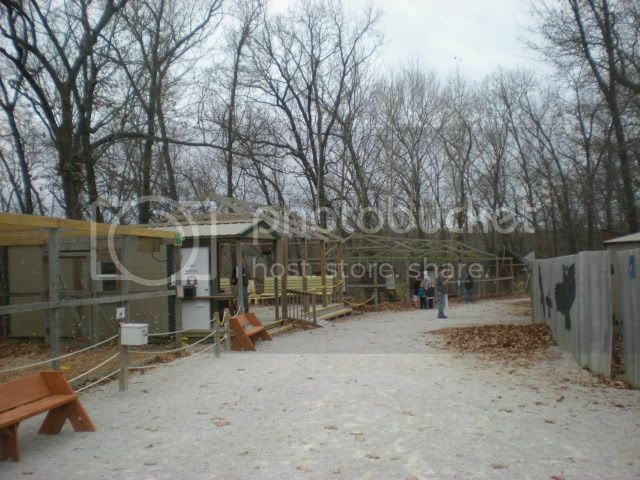 Mass times, tour times, and operating hours can be found on the website. If you do not schedule an official tour, I recommend calling ahead to make sure there is not a wedding that day. I tried to post this "live" but the Blogger app failed on me and has been "publishing" for 2 hours. 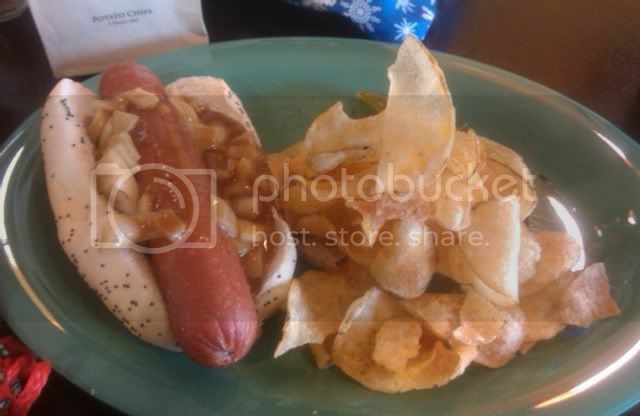 I told Francis when we were walking in that I felt terrible that we hadn't been to Caffe Carnevale in a very long time, because the hot dogs are the best and the service is even better. While we were waiting for our dogs, Gary said, "Aren't you the girl that does the blog?" D'OH. So a shout out for Gary today! Thank you for the gift bags and brownies, and two thumbs up for the Asian dog. Peanut sauce on a hot dog is sheer genius. Caffe Carnevale will be closed for the holidays, but you can find them at 4904 Devonshire on January 2. 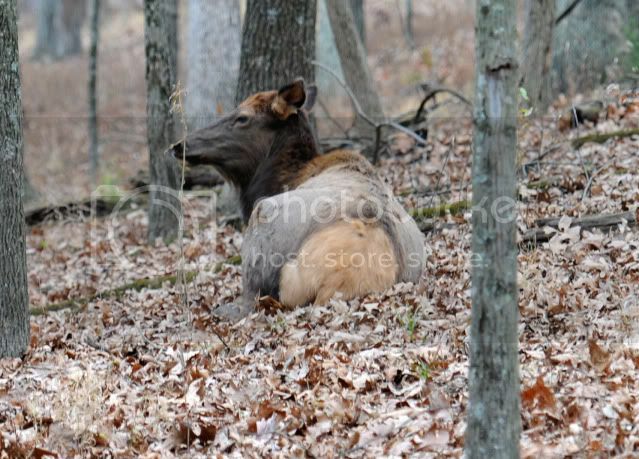 If you live in the St Louis area, you probably heard that the County government was threatening to close a bunch of parks, including Lone Elk. 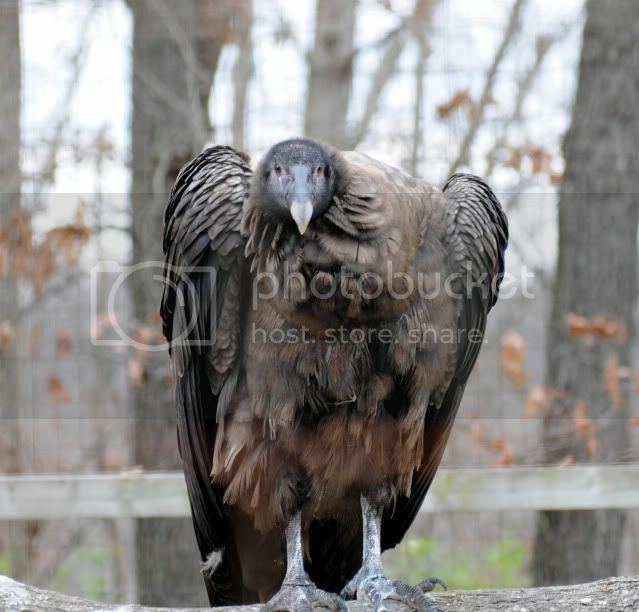 The County's chief operating officer, Garry Earls, was quoted as saying that they were thinking of selling the land and the animals, which prompted a massive outcry. The budget was eventually reworked, as budgets will be. They threaten to cut something people love so that they can get away with cutting something people love less. As it stands now, no parks will be closed, but there will still be layoffs of employees. Of course, there is always next year, when this threat is sure to surface again. 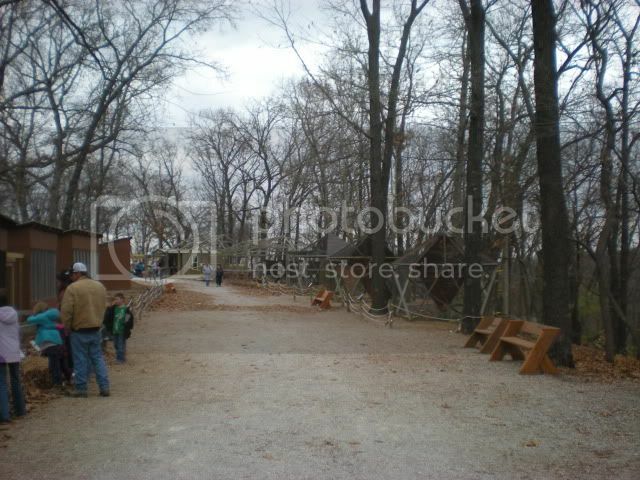 When I heard about the threatened closure of Lone Elk Park, I was horrified, because I love that park. My friend Jennifer and I used to go there all the time in college. Then I realized, wait, college was A LOT of years ago. Had I really been meaning to go for that many years without getting around to it? One of the things I want to be clear about now more than ever is that my mission with this blog is to get you to GO to the place I'm posting about. I never want to give such a exhaustive tour that it would be pointless for you to visit yourself. There is always so much more to see, and if we want to save amazing parks like Lone Elk, we have to use them! Bison! 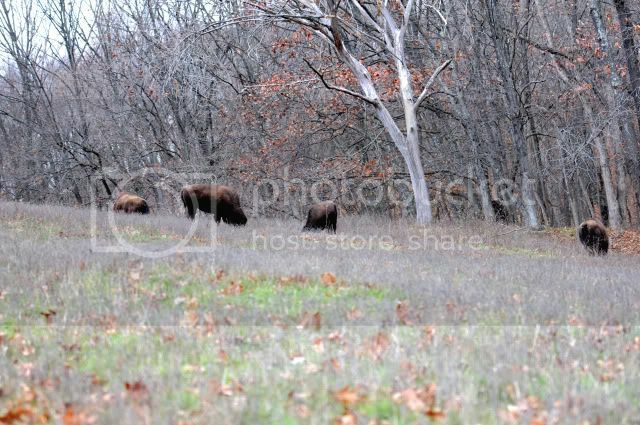 Where else can you see this many bison, this close? Grants Farm has some bison, but you can't get this close to them. 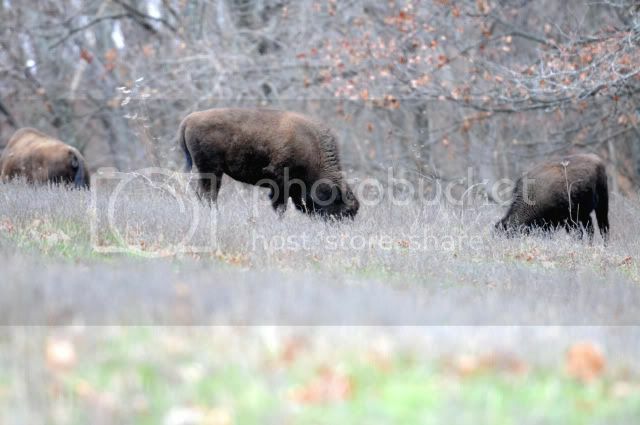 (Safety warning: Do not get out of your car in the bison area. Francis took these pictures from inside the car. There are warning signs and a gate leading into the bison area. Bison have damaged cars, so enter at your own risk.) Lone Elk Park also has elk, of course, and deer. 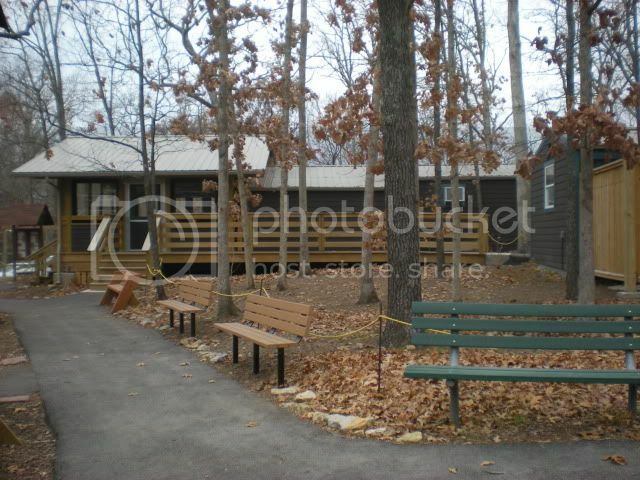 You can fish in the lake, and there are lots of picnic areas and trails. There are lots of geocaches to be found there, as well! So I have a New Years Resolution for you: If you're a fan of my blog, and I've ever made you say, "Wow, I didn't know that was there! I need to check that out sometime!" make sometime sooner than later, and bring a friend! So many of the things I post about are off the beaten path and are in danger of closing. 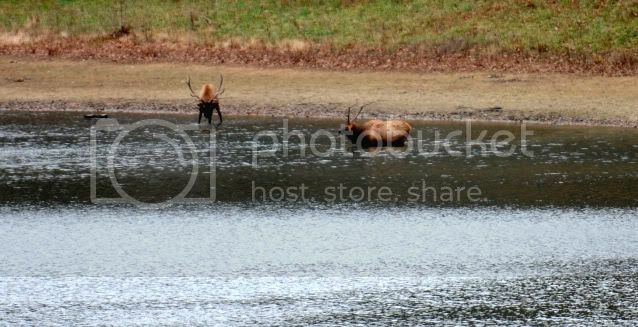 If Lone Elk Park had really closed, I wouldn't have had a leg to stand on in protest, since I hadn't used the park in years. I promise to visit more if you will! 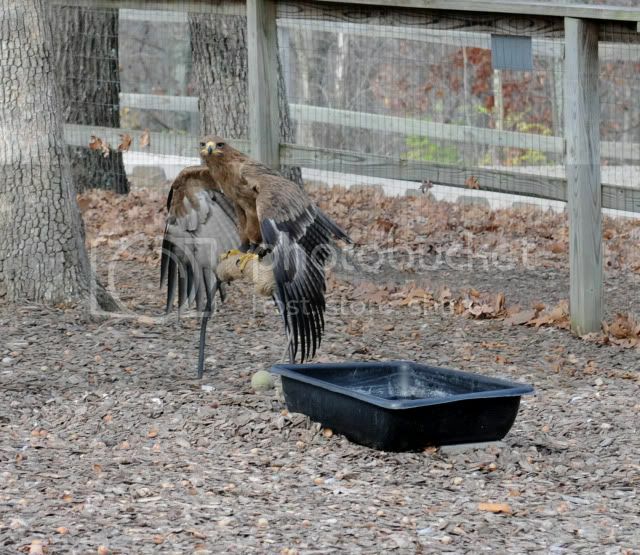 We visited the World Bird Sanctuary at Lone Elk Park a couple weeks ago and my how they have grown! I spent a lot of time at Lone Elk in college, but hadn't been in more years than I care to admit. 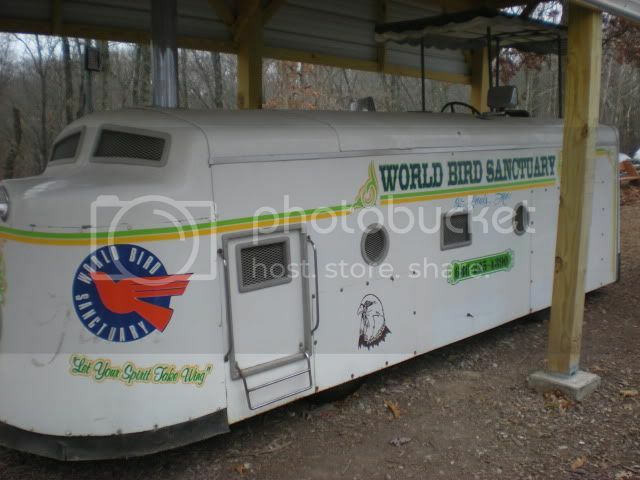 I couldn't believe how much more space the World Bird Sanctuary has these days! All these big flight cages seem to go on for miles. 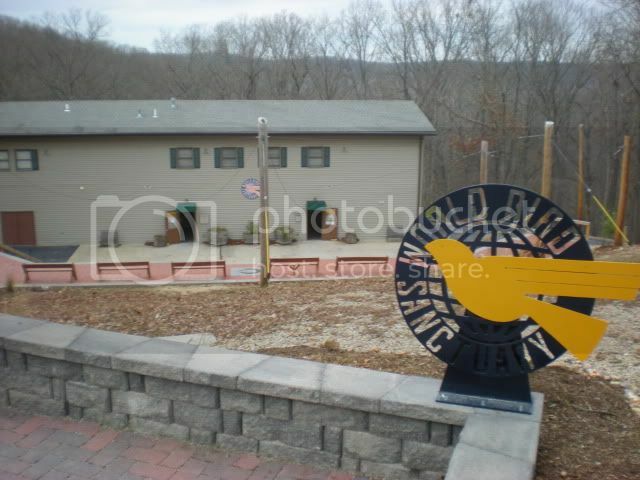 It seems like a large percentage of the outdoor projects were completed by Eagle Scouts, which is just fantastic. Most of the cages have a plaque with the name of the scout and the year it was completed. 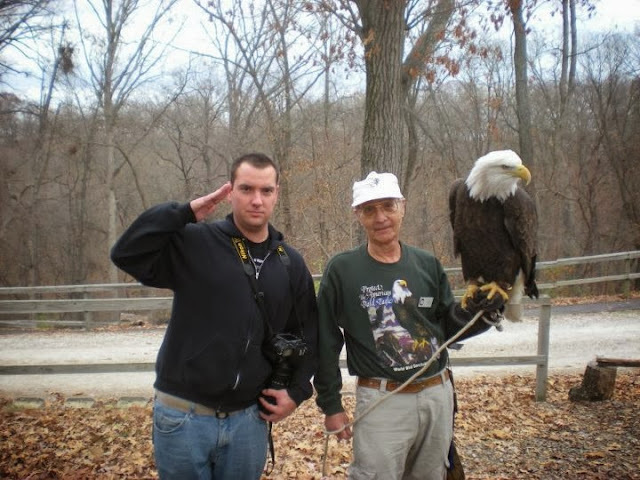 The World Bird Sanctuary was started by ornithologist William Crawford as the Raptor Rehabilitation and Propagation Project in 1977. 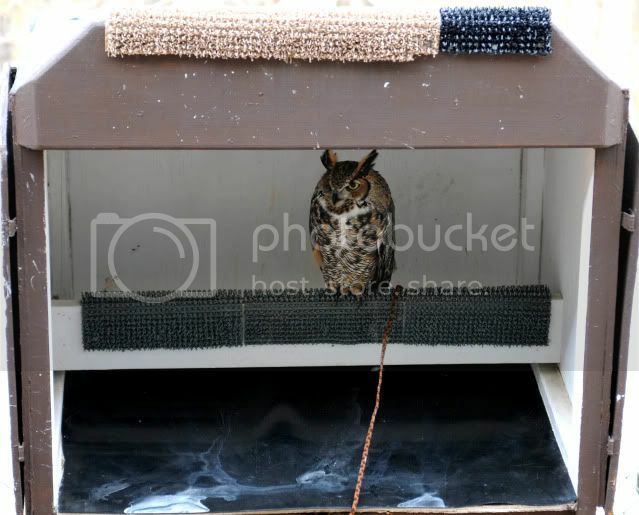 Today it sits on 305 acres and includes nature trails, educational areas, bird watching areas with feeders, all those flight cages, and a big wildlife hospital. 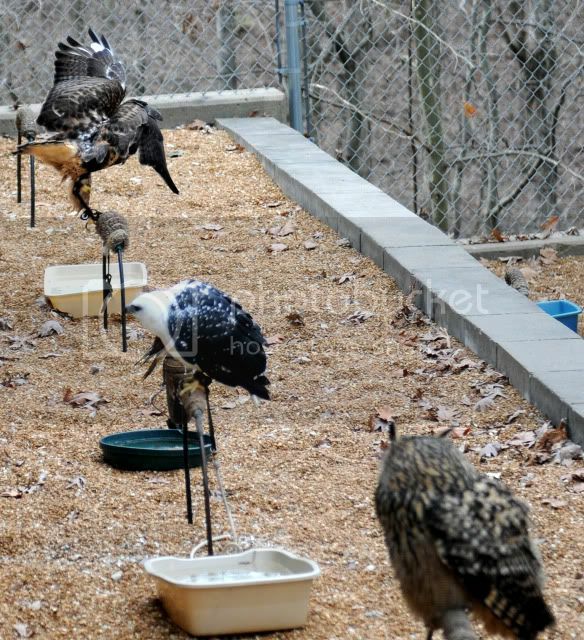 They also have a breeding program that has made great strides in bringing barn owls and peregrine falcons back from the brink of extinction, and have worked with other groups to reintroduce Andean Condors, bald eagles, golden eagles, and Harris hawks. 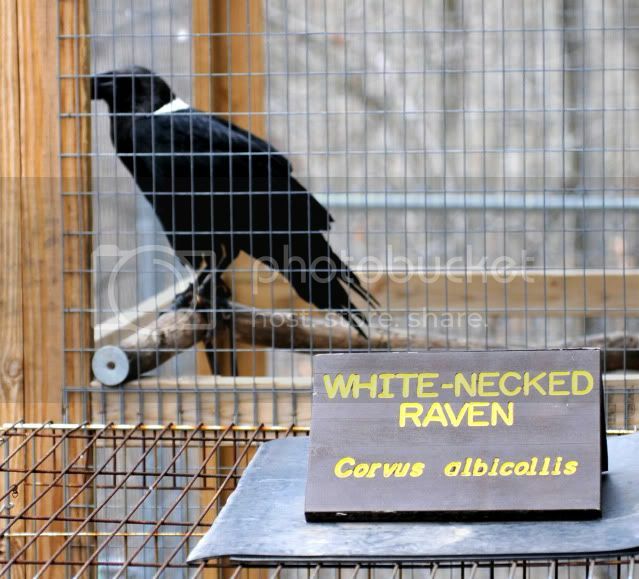 Many of the animals you'll see in the weathering area are birds that were raised in captivity or were brought to the WBS with injuries that prevent them from being released into the wild. 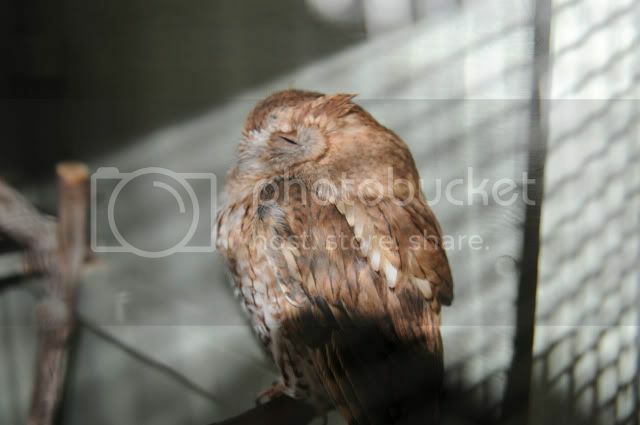 Wild raptors spend 90% of their day perching in trees or on other objects and the weathering area lets them do that. 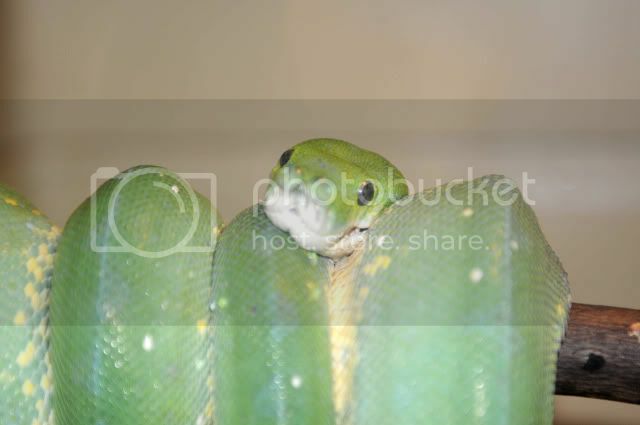 They are tethered with soft leather for their protection. As you can see, they have room to move around. This little guy is my favorite. 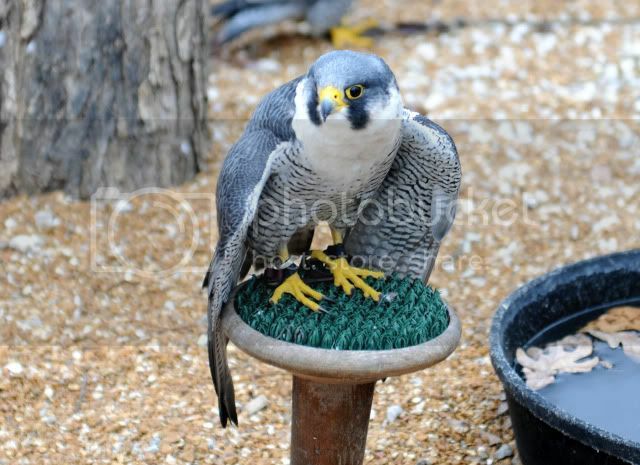 His name is Sirocco, and he's a Peregrine Falcon who broke both his wings when he flew into a fence. 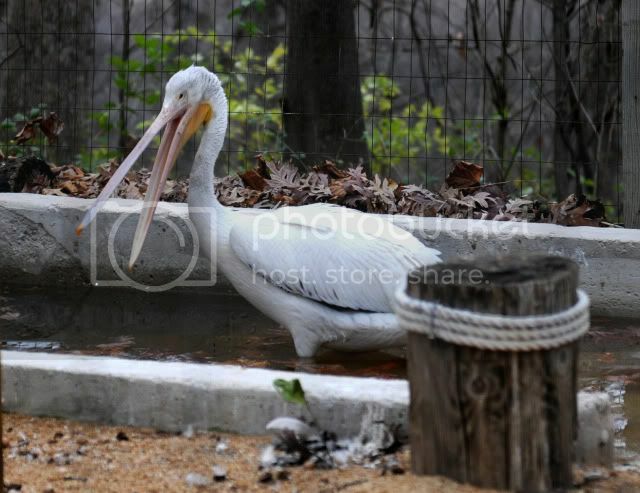 He can fly again thanks to rehab, but not well enough to be released into the wild. 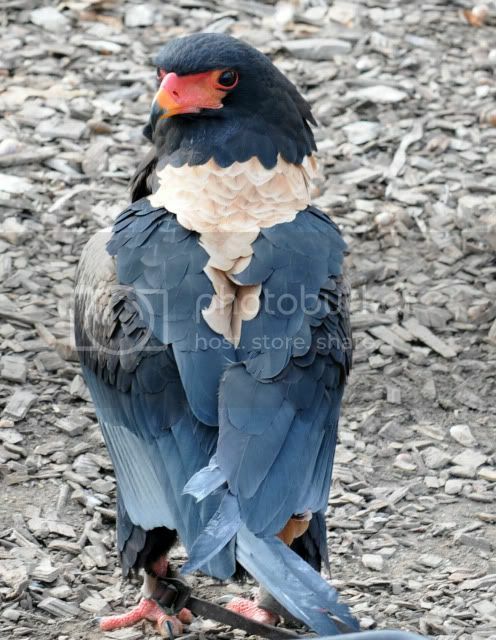 His neighbor is another Peregrine who is retired from the Air Force bird abatement program. 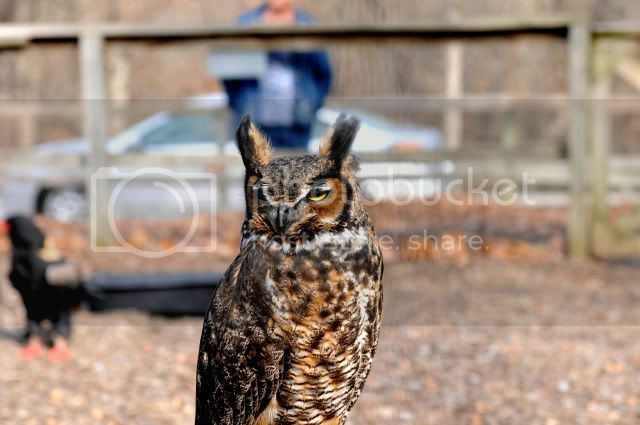 Francis brought what I like to call the paparazzi camera, so now I am just going to show you awesome photos. 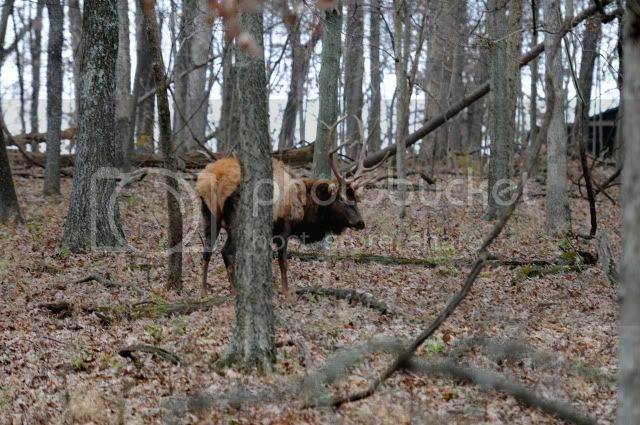 Next week's entry on Lone Elk Park will be awesome pictures of elk. The World Bird Sanctuary is open from 8am - 5pm every day but Thanksgiving and Christmas Day. Admission is free but donations are suggested. There are donation boxes all over the property. 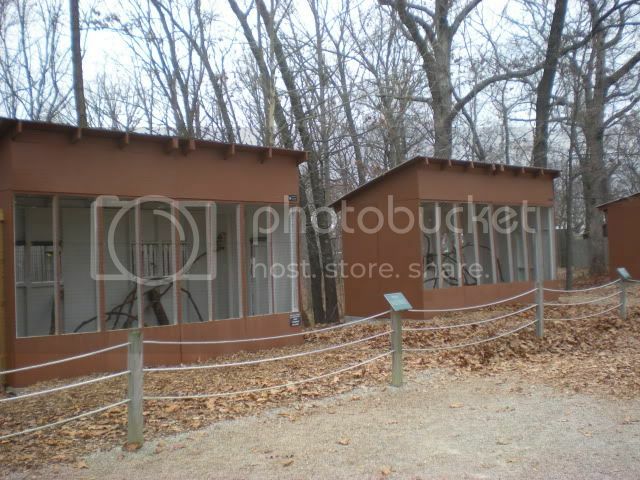 To get to Lone Elk Park and the World Bird Sanctuary, the best thing to do is get off I-44 at the 141 exit and follow the brown park signs.